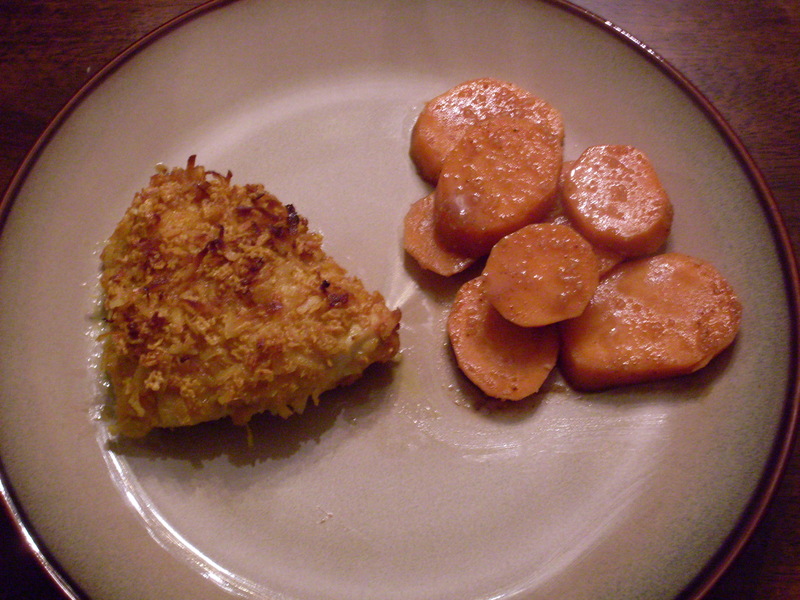 Coconut, curry and orange juice combine to give this baked chicken a crust you can’t ignore! Preheat oven to 375 degree. Spray a shallow baking dish with vegetable oil cooking spray. In a small bowl, combine the orance juice concentrate and egg. In a plastic bag, mix the cereal, coconut, curry powder, and salt. Dip the chicken into the orange juice mixture, then into the cereal mixture. Place in prepared baking dish. Drizzle the melted margarine over the top and bake for 45 minutes. Serve either with a rice dish or with the Easy Candied Sweet Potatoes. Makes 3 servings.